Every company that operates somewhere along the food chain needs to figure out how to implement a modern traceability system. The regulatory environment–which grows more complex by the day–requires it. The very nature of the food industry–where contamination can bring death–requires it. But there is more to consider than regulatory burdens and moral imperatives. 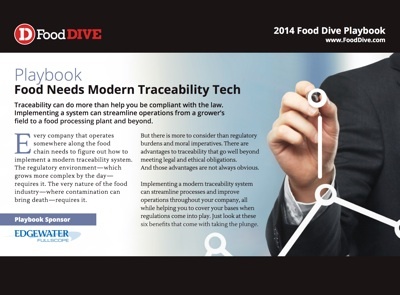 There are advantages to traceability that go well beyond meeting legal and ethical obligations. In a hurry? Email youself this page for later! This Playbook is sponsored by Edgewater Fullscope. A representative may contact you for additional information.